Sam is a Sport therapy graduate, graduating Teesside University in 2015. 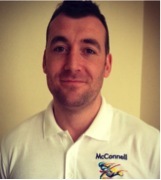 Sam has worked within the industry since 2012 starting out as a sport masseur, in the past he has worked within a sport injury clinic running his own business, he has also worked with Blaydon Rugby club working within the clinic with the 1st team and providing pitch side cover for trauma (emergency 1st aid). Sport massage, focusing on soft tissue manipulation for pain reduction to improve function and flexibility. Mobilisation, implemented to regain lost range of movement, they can be used to improve function or to reduce pain in the acute stage of injury. Kinesio taping, for pain reduction KT can be used after an injury to assist/inhibit a muscle used to correct function. Ultrasound therapy, Ultrasound is a completely safe method of generating heat deep within the muscle by generating sound waves through a crystal head, this method can be utilised to breakdown scar tissue in the chronic phase of injury, it can also be used to promote healing within the tissue. Personal training, training implemented to suite the client’s needs whether that be to increase strength/fitness or as part of a rehabilitation phase after injury.